Readers of this blog know that I spend a lot of time wondering. As I spend more time and gain more experience with the topic at hand, I offer up my two cents. But sometimes conclusions are seemingly far afield until they just hit like a lightning bolt. So it was today. The wonder of it all. I think it is pretty clear that I have one foot planted in another dimension, and right now I’m straddling a time warp. And it is so interesting to be able to look down and note what is unfolding in time, and maybe how things are related. The “other” dimension changes from time to time, but right now it is firmly rooted in the happenings of seventy or so years ago. 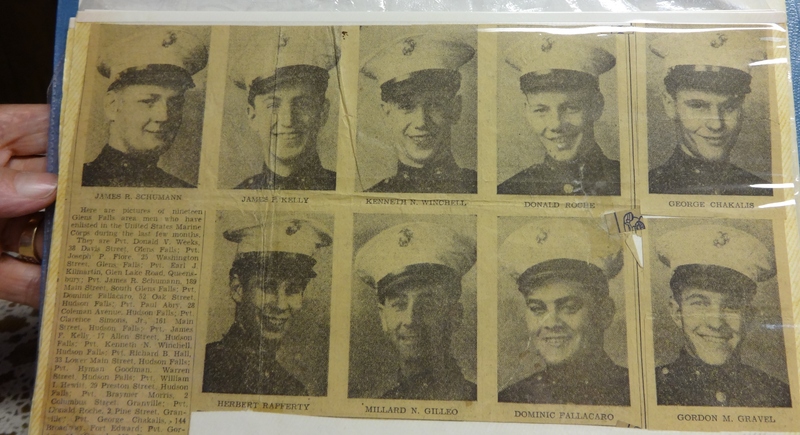 I’m writing a story about a band of Marines, local guys, who went off to war together to fight the Japanese after Pearl Harbor. Out of the sixteen or so I am aware of, I’ve met and interviewed at least half. And all but three now have passed. So I recently got an email from a daughter looking for me to talk to her dad. He had read some of my stuff, saw that I had talked to his buddies, and was ready now to say something, for the record. Glens Falls Post Star. Dom Fallacaro, bottom row, third from left. It probably hit me midmorning, looking at the newspaper clippings from 1942-3. Seeing the scrapbook pictures of Marines who were going off to fight the war together. Young guys just out of boot, all spiffed out in their new uniforms. Greenhorns with no real idea of what they had gotten into. Some did not return. I sat across a table from a 91 year old who was telling me the story of World War II from the perspective of a kid growing up in the Great Depression. So he began to speak, with his wife of six plus decades by his side. Dom was starting stories, and I was finishing them. Not in a rude way. But in a sense, it was like I had been there too. And I think it made his day, in a way. All of Dom’s buddies have died, or the few who remain are dying. It’s a tough time in a veteran’s life. Dom’s cousin Dom. KIA June 1944. Or when Dom began to tell me about his cousin, who shared the same name as he, from Buffalo, NY, who was killed in 1944 in Europe. His wife Grace pulled a tattered newspaper clipping out of the scrapbook, one that Dom carried in his wallet for years. Dom told me that he was lying down and one of his tentmates from Buffalo was reading the newspaper from home, and tossed it over to him, telling him that “he” had died. Shocked, he clipped his cousin’s death notice and carried it in his wallet for the rest of the war. 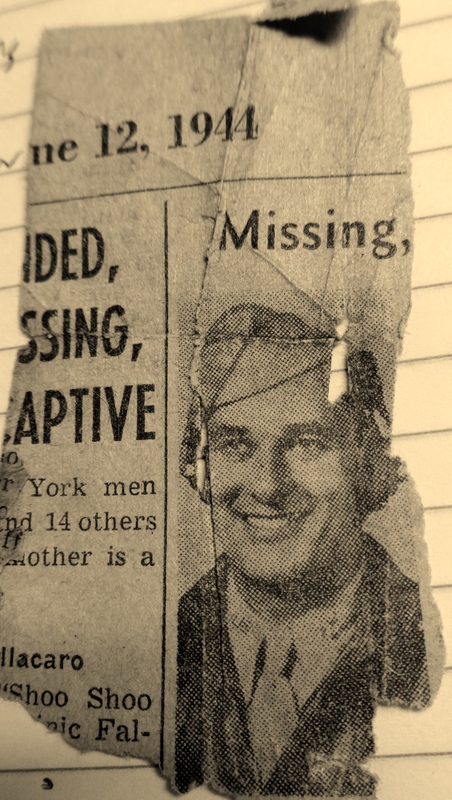 When Dom started to tell me the story, I knew that a WW II era New Yorker with the same name from Buffalo had died, as I had done some on-line research on Dom before coming to the interview. So I told Dom his cousin had been in the Army Air Corps. He nodded and then we connected the cosmic dots. About nine months later, Dom suffered an extreme appendicitis attack as the fight for Iwo Jima wound down, and wound up being operated on as they sailed away, nearly dying. The ship he was on had even altered its course to save the young Marine (the doctors demanded the ship stop shifting and zigging and zagging so much during the critical operation. As Dom said, his buddies did not realize he was so important!) 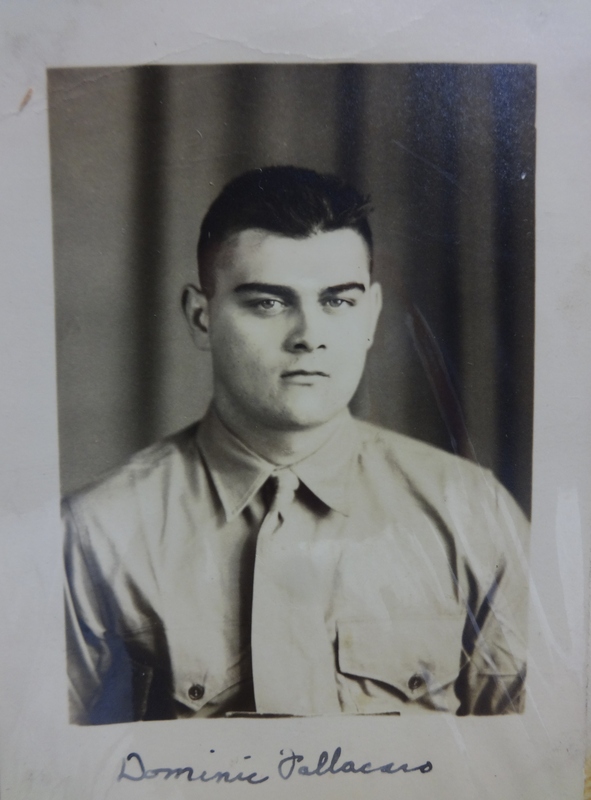 He was on Guam returning to his truck driving duties and preparing for what would have been the Nov. 1945 invasion of Japan-his outfit was scheduled to be in the first wave-when the atomic bombs ended the war. So you can guess how he felt about that. I sat with him and his wife Grace for two hours. Turns out the grandmother I never knew-she died before I was born-would clean and mend the curtains of the family and for the mom and pop store that Dom and Grace ran for forty years, seven days a week, fourteen hours a day. After the camera was put away, four generations from our little town had lunch at the table at their camp on Glen Lake. For a kid who dropped out at age sixteen-“are you going to be a professional student, or are you going to work?” was the question of the day, in the Depression era-Dom looked around and fairly beamed at what it all meant to him. He saw things that he put away for many years. Grace knew, from the naps he would stir restlessly in. He might not have shared everything with his family, but his family kept him going and together, they prospered. Now, here, as the old war buddies who survived pass on, maybe it is time for reflection. Dom is a survivor too, and he knows it. What blessings he shared with me today. And I think that is what he really wanted to say to me today, why he wanted to talk. How blessed he is, for his family, for their love, and for the love of his buddies. After 91 years on this earth, the wonder of it all. Such a great blog, Matt! It’s wonderful that you are living in two time periods – you bridge time & space for your students and perpetual students (like me).